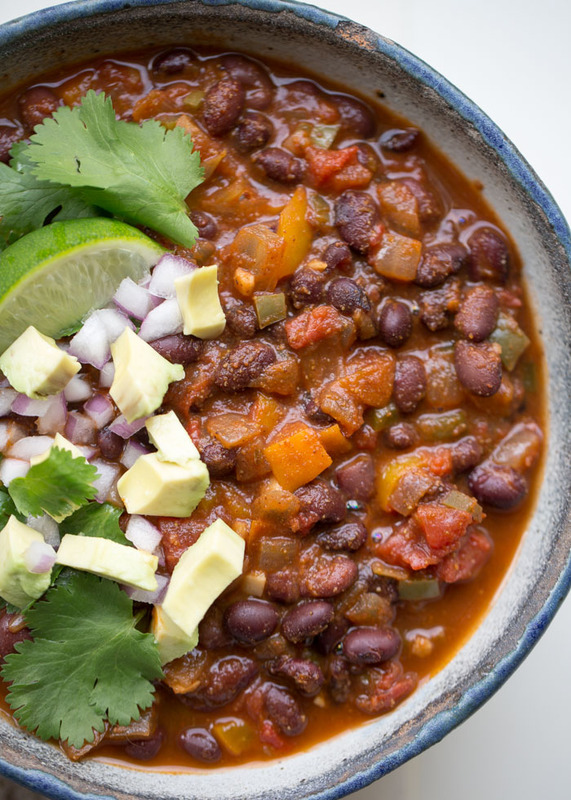 With less than 10 ingredients, this hearty chili comes together quickly and easily. It might be fast and simple, but thanks to the magic of pressure cooking, it tastes like it simmered all day. So, so good! 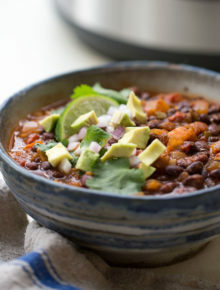 When it comes to easy wintertime dinner recipes, having an excellent (yet simple) chili recipe in your back pocket is a no-brainer. In our house, chili is a staple. It pretty much happens weekly this time of year. 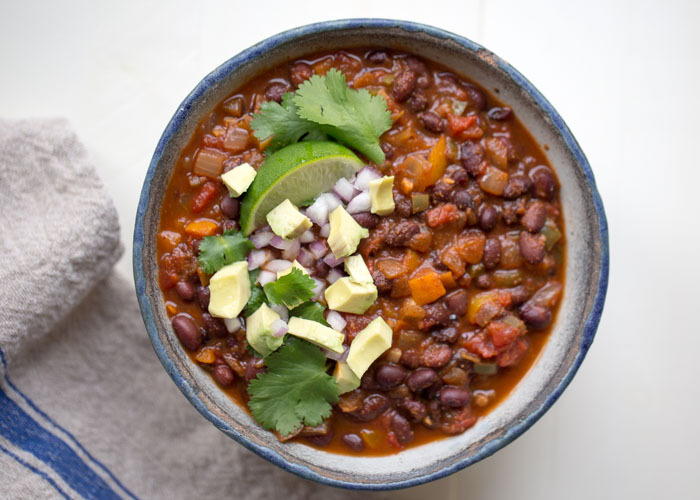 Chili is just one of those meals that bridges the dietary divide – I love, love, love that it appeals to (and can easily be customized for) vegans, meat-eaters, gluten-free-ers, and vegetarians alike. Generally, we start with a tasty base of beans, veggies, and spices. Most of the time, my carnivorous guy is actually plenty happy if we stop there, but sometimes he likes to top his with a bit of cheese and sour cream. Other times, he might stir a bit of cooked ground beef or shredded chicken into his serving. Meanwhile, I enjoy a vegan version. Either way, it’s hearty, delicious, and comforting. Yesss. 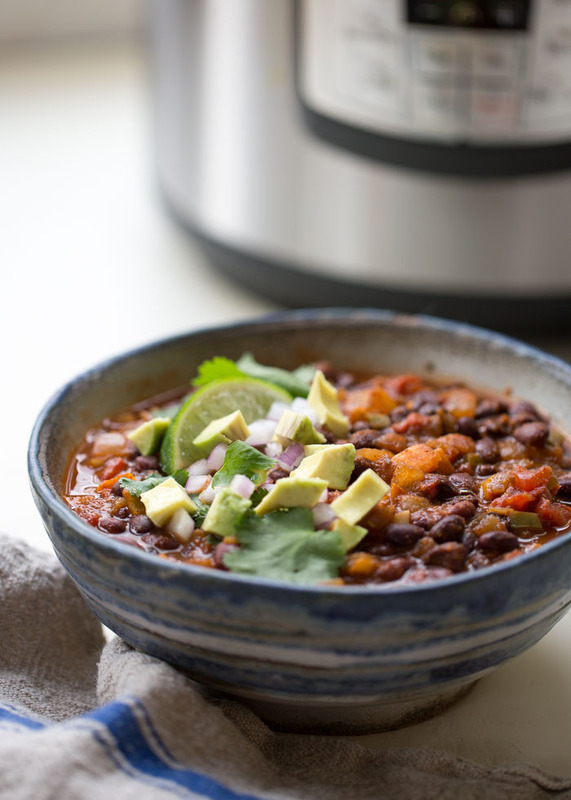 I have several chili recipes here on Kitchen Treaty, but none that took advantage of the Instant Pot in all of its greatness. Until now! Because today I have for you a super simple Instant Pot chili recipe that might just become your own back-pocket chili recipe. It’s certainly become mine. 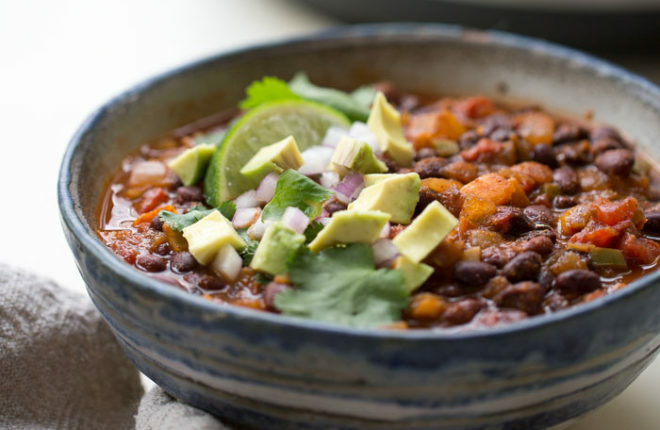 This Instant Pot chili recipe takes advantage of the flavor from chili powder, cumin, veggies, fire-roasted crushed tomatoes, and, of course, the flavor-boosting situation that pressure cooking brings to the table. This Instant Pot chili recipe is super easy to make, too. Simply saute onions, bell pepper, and oregano together in the Instant Pot. 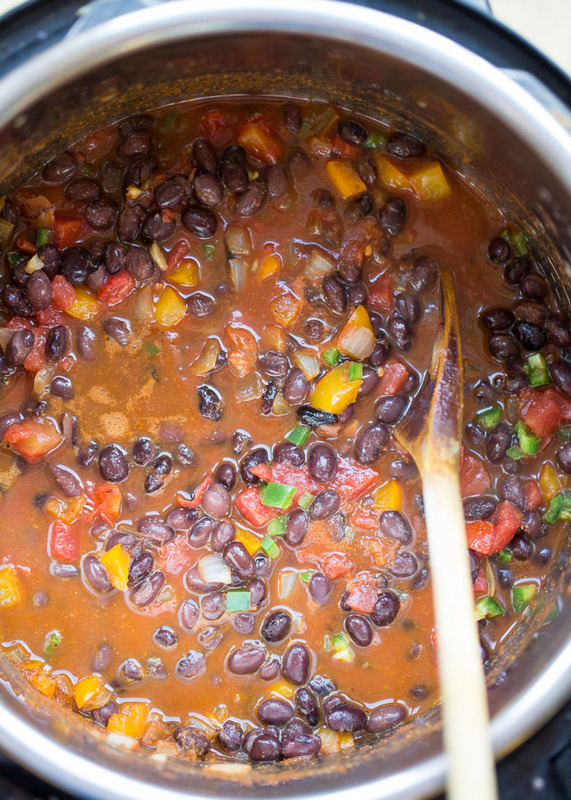 Then add garlic and spices, saute for one more minute, pour in the jalapeño, tomatoes, black beans, and water, and stir. Then just hit a few buttons and hearty deliciousness is on the table in no time. This is without a doubt our new back pocket chili recipe. I hope you find it pocket-worthy too! Hit “Saute” button on your Instant Pot. Add olive oil. When hot, add the onions, bell pepper, and oregano. Saute, stirring occasionally, until tender, about 7 minutes. Add the garlic, chili powder, and cumin and cook, stirring constantly, for one minute. Add the beans, tomatoes, jalapeño, salt, and water. Stir to combine. Place the lid on the Instant Pot and make sure the release valve is in the “sealing” position. Press the “Manual” button (or “Pressure Cook” button on newer models) and set the timer for 5 minutes. After the 5 minutes is up, quick-release by flipping the release valve to “venting.” Remove lid. Scoop into individual bowls and add toppings if desired. Keeps in the refrigerator for about 3 days. Freezes well too. * Recipe cook time includes sauté time and ramp-up time (when the Instant Pot is building pressure). Hands-on time is about 25 minutes including gathering ingredients, chopping veggies, sautéing, and preparing any toppings. ** I suggest tasting a bit of the flesh of the pepper before deciding how much to put in. Jalapenos can really vary in heat. If the flesh is mild (sometimes it’s so mild it tastes like a bell pepper!) and you want some heat, you will probably want to add some seeds. If the flesh is already spicy, you may want to omit the seeds altogether and/or only add half of the pepper. I LOVED this recipe. The only issue I had with it is my newly purchased Instapot registered “BURN” when I followed this recipe. I needed to take out the mixture, scrub out the charred bottom, add a cup of water and restart the cooking. After that though, one taste and I was hooked! I’ve returned on desktop to print and save. I’m so glad you liked it! But I’m really thankful you let me know about the burn warning. Thank you (and sorry!) I need to invest in a newer Instant Pot and retest all of my recipes because that’s been happening to another one of my Instant Pot recipes too. I have a 6 quart version that’s just over a year old and apparently it cooks differently. Do you have a 9 quart? I made this over the weekend and it was delicious. I did no have an issue with “BURN”. In going back to print this out, I discovered I mis-read it and used 3 cans of black beans instead of 2 but it was still delicious. Will definitely make this again! I made this as a simple meal with nice bread and toppings for 6 people, 1 vegan, and 1 vegetarian. I would make this again, and 2 of the non vegs asked for the recipe. Tasty, healthy and inexpensive. I didn’t get the burn message. Can I cook the chilli in normal pot if yes how long. Sure! Just saute the veggies, add the remaining ingredients, bring to a boil, and I’d say let it simmer for about 20 minutes or so to let the flavors meld. What about uncooked beans. Should I follow the same instructions sauteing the vegetables first. That would probably work. I always soak my beans first. And cooking time will be longer. If you try it please report back! Hi Kare, wonderful recipe. I have also had issues with BURN. I have made this chili four times at this point, and 3/4 times, it has resulted in BURN. I have the newer mode 6oz pot. Regardless, the flavor is great and I will continue to make this recipe on the stove top moving forward. Hi Harrison, thank you for sharing. I need to get myself a variety of Instant Pots, it seems, to test all my Instant Pot recipes in and make sure they work across the board! Now to find the storage, ha. I’m glad you like the recipe anyway! This was AWESOME. I never take the time to leave reviews, but can’t wait to make this again. So quick and delicious. I didn’t have the jalapeno on hand so to get that extra kick I subbed a can of black beans for spicy chili beans. Just awesome! Thanks! Hi Julia! I’m so happy you liked this one and really appreciate your review. Thanks for sharing about your substitutions too; that helps others who try the recipe! Thanks again! This was the first recipe I made when I got my instant pot, and it’s fantastic. Simple but delicious and a great starter recipe if you’re as anxious as I was about starting out. Thank you! I was super anxious when I first started with my Instant Pot too! I’m so glad you gave it a go with this recipe. Thanks so much for coming back and leaving a review. Enjoy your IP! I just made this recipe (literally eating it now) and it’s so good! I added an extra can of tomatoes and some vegetable broth instead of the 1 cup of water and it’s great. It’s a bit more liquidy than I’d like, though, so next time I think I’ll stick with just the extra can of tomatoes and NO broth. I also mixed it up and went with one can of black beans and one can of kidney beans. Very delicious— my boyfriend just went for seconds! Love that idea – I’ll have to try it next time! Thanks Riley! I made this following the recipe and loved it- no burn message here. We’re stuck in a polar vortex right now and I want to make it again but would like to add sweet potatoes- you think that would work? Sounds delicious! Hope you warm up soon! New instant pot user and long-time vegetarian — I love this recipe! Got the burn error the first time, but looked up some tips online and found that if I mix all ingredients, then add tomato sauce at the very end and do not mix, the pot came to pressure no problem. Mixed everything after venting and turned out great! Thanks for this! Interesting! Thanks so much for the tip. I love this chili! I especially love that it is vegan! To make a double batch (at one time), can I just double everything in the pot? Or will that negatively affect the outcome? Hi! I’m so glad you like this recipe; thanks! I’ve doubled this one in my 6-quart Instant Pot with success. You accomplished your mission. I don’t know how you did this but the meat eaters in my home prefer this recipe to the ones with actual meat in them. Woo hoo! 😉 I’m so glad everyone likes it. Thanks so much for coming back and rating the recipe. Wow, I have to disagree with all the glowing reviews. After 5 minutes pressure cooking, this just tasted like barely-flavored water with mostly raw spices floating in it. I’m adding some tomato paste and cooking it for another 5 minutes… Not sure what I did wrong; I followed the recipe as written. Hi Dawn, did your Instant Pot seal? Update: Maybe my problem was that I have an 8qt pot instead of a 6qt. Half a can of tomato paste diluted in about 2/3 cup water, and pressure cooked for another 5 minutes and it was really delicious. Might have still been good with just a longer cook time in the 8qt. Served over jasmine rice and will make again! Thank you! So flavorful! I have a new instant pot and also got the “burn” signal, but it turned off quickly. I tasted it after adding the salt and thought it needed an extra can of beans. Glad I did- it’s perfect. My 12-year old wanted seconds. Definitely making this again.